No, really. Don’t let my poor photography skills fool you. 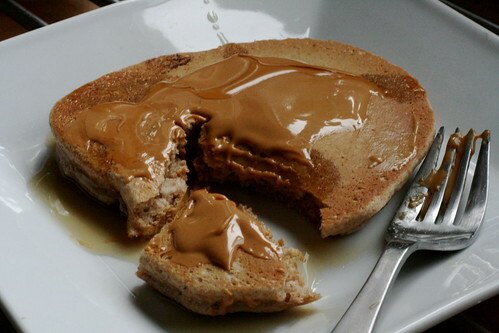 These are the best whole wheat pancakes I’ve ever had. The best ANY pancakes I’ve ever had. And I’ve been eating them my entire life, because I’m just that lucky. I never order pancakes in restaurants because they just can’t live up to my expectations. And the best part about these pancakes? They’re ridiculously hard to screw up. 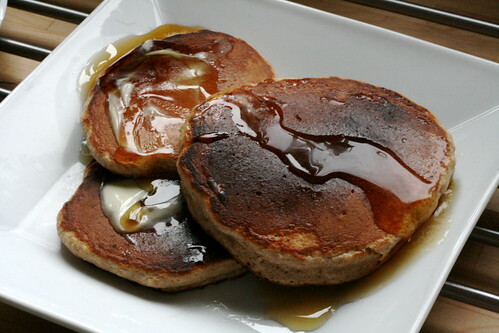 Even when I couldn’t boil rice, I could make these pancakes in my sleep. Throw out your Bisquick, folks! You don’t need it anymore. 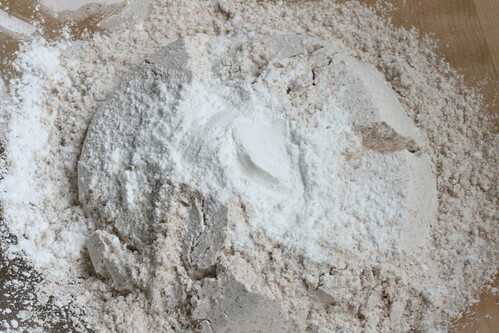 Start with whole wheat flour and baking powder. 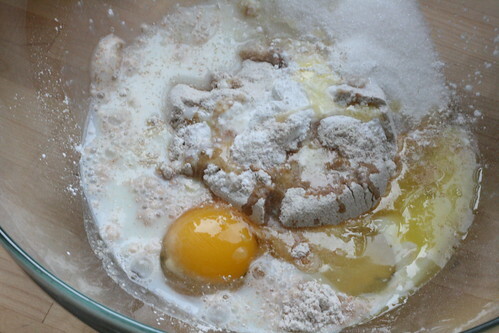 Add an egg, melted butter, and a little bit of milk. Start to mix, but don’t try to get all the lumps out. The lumps are your friends. Don’t be afraid of the lumps. 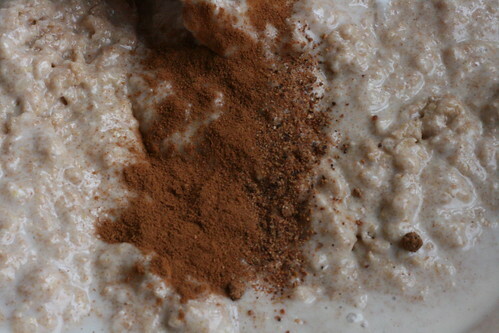 I like to think of cinnamon and nutmeg as the secret ingredients. So for the sake of my fun, when you sprinkle them over the batter, snigger uncontrollably and make sure no one can see them going in. Please? 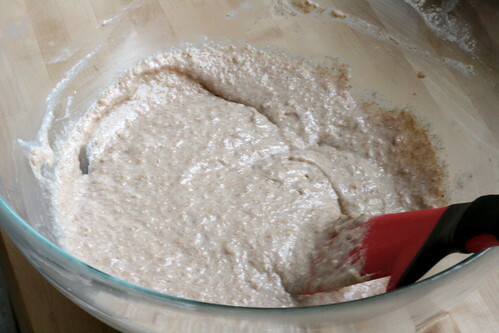 Add milk in small amounts, until the batter is moist, but not drippy. 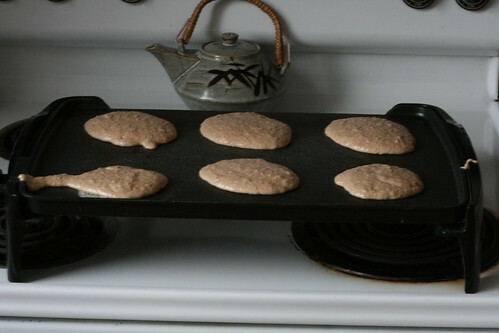 When you pick up the spatula, the batter should ooze off back into the bowl. 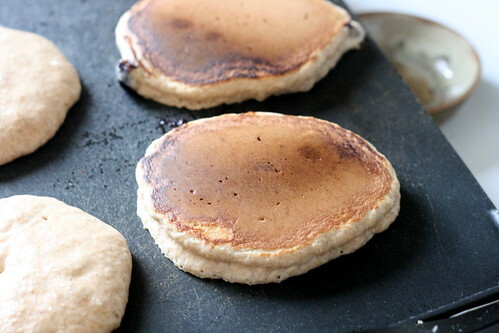 Drop the batter onto a griddle. Mine heats terribly unevenly, and it drives me crazy that the pancakes on the left don’t cook as fast as the pancakes in the middle. It’s supposed to go from left to right! Left to right, I say! I get over it pretty quickly, though. If you’re going to add anything extra, like blueberries or chocolate chips, now is the time. 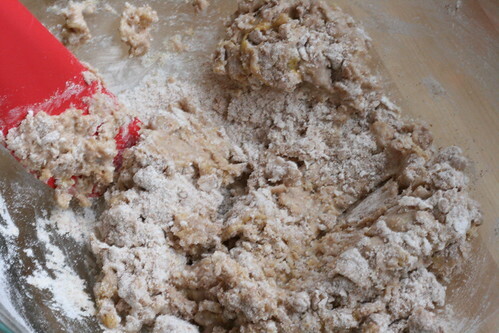 Don’t just add them willy-nilly to the batter. Alton Brown would never approve, and it’s important to listen to Alton Brown. Plus, this way you can do more than one style. As a side note, our pancakes of yore NEVER had mix-ins, or toppings, or sprinkles. 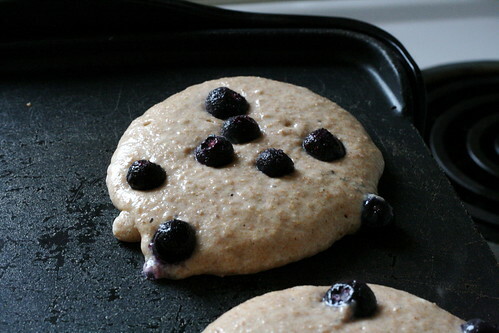 Just to be a rebel now, I love to put fresh huckleberries in my pancakes during the season. But blueberries, even frozen, are an excellent substitute. 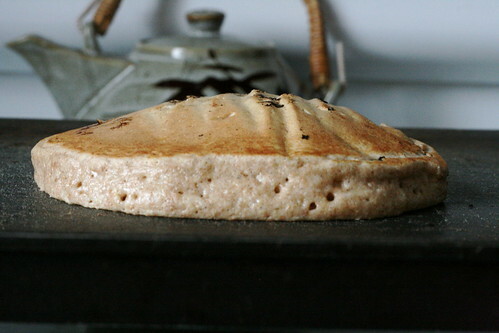 These are not your typical restaurant style cardboard pancakes, my friends. No, these are the pancakes of legend. Makes about 8 very thick pancakes. 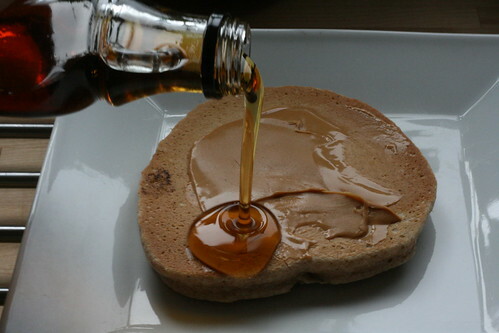 For thinner pancakes, add more milk. I’m with you, there’s nothing like home made from scratch pancakes. My recipe is very similar, but I put only a tablespoon of sugar, if any. The melted butter in the batter really makes it! Sometimes I add chopped walnuts and/or leftover brown rice to the batter. I don’t do the spices, but my teenager loves ’em. Cheers! Oooppppssss the family secret is out now! 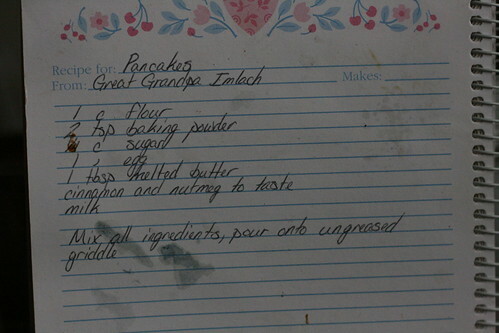 We had to pry this recipe out of my Grandfather because they were his thing to make every Sunday morning. Please give William John Imlach Jr credit for this recipe if you copy it.